Foreign doctors in the UK will face a more rigorous assessment, after figures showed a high proportion of doctors who are disciplined are from overseas. In the last five years, 63% of doctors either struck off or suspended by the General Medical Council (GMC) were trained outside the UK. Yet they make up only 36% of doctors on the medical register. The GMC said new reforms included an induction programme, better checks and a review of the present testing system. Niall Dickson, chief executive of the GMC, said: "We absolutely acknowledge that when it comes to the serious end of the scale, those from overseas are more likely to appear, and we have set about a series of reforms to address this." A new induction programme for all arriving doctors is due to launch as a pilot scheme in early 2013. It will combine online training in British medical practices with a one-day course covering some of the key issues facing new arrivals. There will also be a review of the Performance and Linguistic Assessments Board (PLAB) test for overseas doctors. This is the system whereby doctors have to demonstrate their clinical skills and competence before they can join the medical register in the UK. 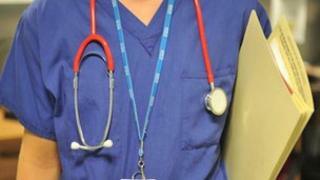 The GMC said there is also a new system of checks - known as revalidation - that began this month. This requires all doctors in the UK to show they are keeping up to date and are fit to practise, based on an annual appraisal and feedback from patients, doctors, nurses and other colleagues. The UK is the first country in the world to introduce such a system across its whole healthcare system, the GMC said in a statement. The figures for disciplinary action were initially obtained in a Freedom of Information request to the GMC by the Sunday Telegraph. They show that in the last five years, there have been 669 doctors either struck off or suspended, and 420 of them were trained abroad. Dr Vivienne Nathanson, British Medical Association director of professional activities, said: "It is clear that doctors who have qualified overseas are more likely to be subject to disciplinary action. "However, more research is needed to understand why this is the case. The UK is still short of doctors and so we must ensure that those who come from overseas are given adequate support to be able to practise medicine in the UK. "It is critical that all doctors that work in the UK have appropriate clinical and communication skills as well as an understanding of UK law and culture and of how the NHS works." Julia Manning, chief executive of centre-right think tank 2020 Health, told the Telegraph the figures were "worrying and shocking" and said there was an urgent need to review the assessment of arriving doctors. Dr Umesh Prabhu, national vice-chairman of the British International Doctors Association, told the paper there were cultural differences and communication problems, rather than differences in clinical training. A Department of Health spokesman said the checks being introduced would "ensure that the small number of dangerous, often overseas trained, locum doctors who do not understand the British medical system are stopped from treating patients". Doctors from outside the EU must take rigorous language tests but there are moves to extend this so that all doctors have to prove they are fluent in English. This follows the death of a 70-year-old who was given a fatal painkiller overdose by a German locum doctor with poor English who was working his first and only shift in the UK in 2008. Should foreign doctors have inductions?